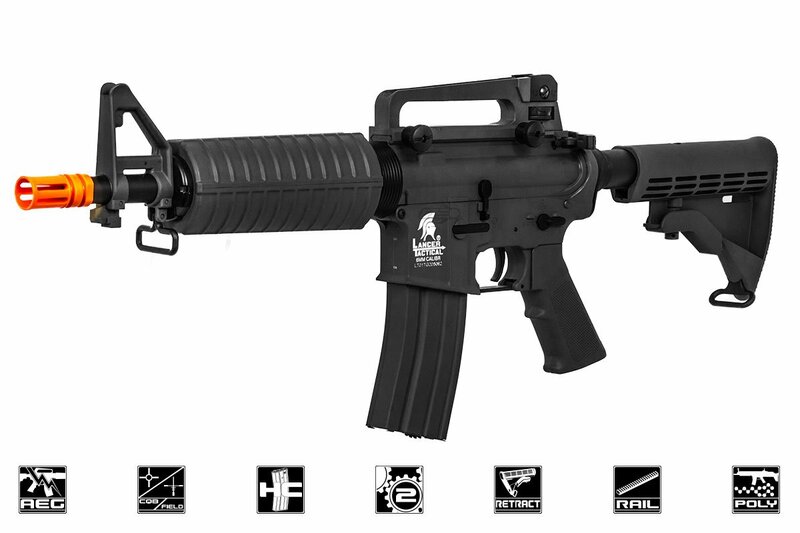 Quickly maneuver around the airsoft battlefield with the second generation of Lancer Tactical airsoft rifles. This remarkably affordable carbine will put you in command of the field as well as of your budget. The Lancer Tactical Generation 2 M4 M933 Commando Carbine from Airsoft GI features a newly upgraded, nylon-reinforced polymer body. That means it is tough and durable rifle but also incredibly lightweight. You can maneuver much better and play until you are the last man standing. This carbine is shorter than the standard length of most assault rifle platforms, giving you the freedom and mobility needed to take the advanced position to give you the edge on the battlefield. It's also great for maneuvering through woods and brush or around obstructions. The gun features an adjustable front and rear sight, so you can dial in and zero your shots, and a detachable carry handle, so you can attach your favorite optic. Two sling loops are at the front and rear of the rifle. If you like, attach a sling to make the rifle even more comfortable to handle. Internally, the second generation of these Lancer Tactical guns comes with standard Version 2 gearboxes. That makes upgrades and modifications easy to come by. These upgraded gearboxes boast a long list of quality features: an upgraded motor; 8mm ball bearings to ensure the gears spin more efficiently, with less friction' a quick-change spring system; and low-resistance wiring to ensure steady electrical flow from your battery to your rifle. The rifle also features a 6.03mm tight-bore barrel and a rotary dial hop-up unit, to allow more precise, accurate shots at range. This model shoots approximately 375 to 395 feet per second out of the box, making it field legal and perfect for long-range engagements. With its comfort, range and advanced features, you'll be able to make plenty of kills out there. Best of all, these guns come with a high-capacity magazine, a 9.6V battery a smart charger - all starting at an amazingly low price. Whether you're a beginner looking to get your feet wet in the exciting and fun game of airsoft or an established player looking to save a few bucks, this great gun deserves your serious consideration. 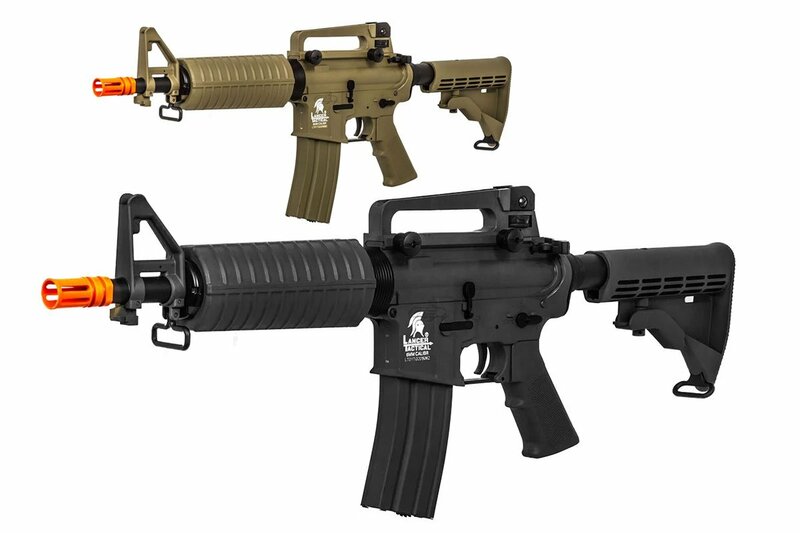 Pick one up and enter the fight with one of these second generation Lancer Tactical M4 carbines.